There is nothing the fantastic Sahel Sounds label puts out that can’t be classified as essential listening, but we have an extra special place in our hearts for the record guitarist Fatou Seidi Ghali & vocalist Alamnou Akrouni put out just last year. As Les Filles de Illighadad they play an ultra minimalistic form of desert blues; dreamy and laced with melancholy but at the same time tough and raw. There is quite an abundance of Tuareg guitar bands touring Europe these days, but the Niger based Les Filles are something quite different and wholly unique. This is their first time in Belgium and if they’re half as good as on record, they might very will be the highlight of this festival. 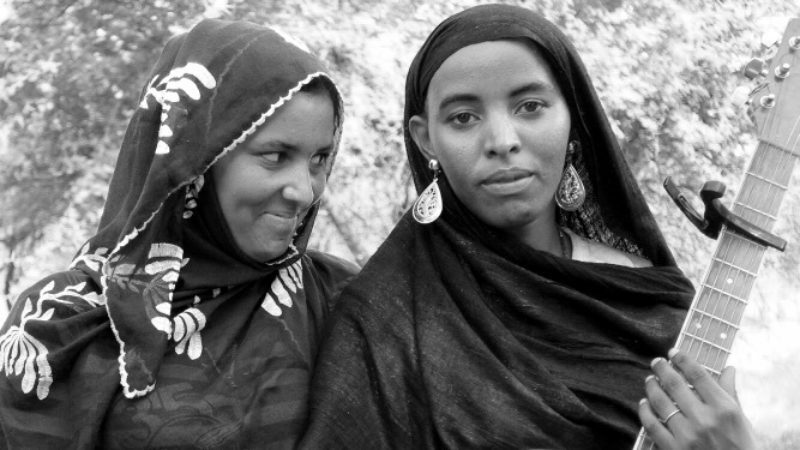 Modern Ishumar tuareg music is not just a male affair anymore, let it be heard. We now slowly see female artists stepping out of the shadows, bringing with them the tradition of female chants set in an acoustic sound. Fatou Seidi Ghali & Alamnou Akrouni are two young women from Niger who call themselves Les Filles De Illighadad, named after the village where they come from. Illighadad is a small village in the central heart of the Niger Sahel, a clutter of mudhouses without electricity or wi-fi access. It’s a world apart from Agadez, from Niamey – both major cities in their own right, dense with people, noise, and the trappings of modernity. During the rain season, the desert is vibrant and green, after the rains have parched the otherwise thirsty landscape. The desert here is cyclical, and follows a predictable schedule. The days in Illighadad are long, and time is not measured by hours, meetings, or not even by the muezzins prayer call – but by the suns passage, the movement of the animals, and the sound of the crickets. Music here comes with the rural character of the seasons and the extremes of weather are not easy on musical instruments, which often appear in a dried, bended and worn state. Fatou Seidi Ghali plays an old blue guitar that has been tormented by these conditions. As one of the very rare Tuareg female guitar players, her playing style is measured and calm, and speaks to a different pace. Before recording the session that would become the album, Christopher Kirkley of Sahel Sounds saw Fatou playing a long session. It moved seamlessly from one song to another, with many covers of Tuareg group Etran Finatawa whose music is renowned in this part of Niger and the main inspiration for her to pick up the guitar. She insisted that she doesn’t just play guitar, but plays and performs tende as well with her cousin Alamnou Akrouni, a renowned vocalist. The “tende” is named for the drum, stretched with an animal skin and is joined with polyphonic chants. In a place with the absence of sound, no hum of electricity, no cars, no white noise, and no physical impediments, the tende travels far. As the village plays, people get drawn in from around. Singers exchange the lead, backed by the chorus of Illighadad echoing in polyphonic harmonies, with staccato clapping, led by a deep and continuous thumping that goes on for hours. The debut album Les Filles De Illighadad on Sahel Sounds was one of sublime and intimate purity, recorded under the trees in the open air of the desert with fluttering bird sounds in the background. While Christopher Kirkley had the original concept to meet Fatou and record her guitar, every night was accompanied by tende. Guitar by day, tende by night, as the tradition goes, a reminder of the village music that inspired the guitar, and continues to do so. In the end, they produced an LP with two sides – each unbroken sessions, representing the two sides of the music: the mellow guitar and personal expression of Fatou in intimate songs, the timid voice of Alamnou flickering back and forth like a firefly and the cooperative and constant village music of the tende. It’s sublime dreamy Ishumar music for those who want to get intoxicated. Eastern Daze is proud to support their first ever tour in Europe and it promises to be quite an impact.